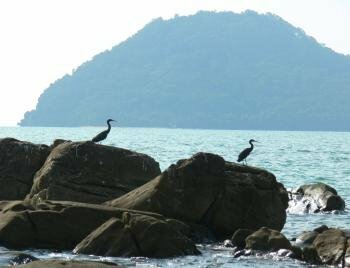 Pulau Tukong Ara is a rocky outcrop located in the Santubong Bay, close to Satang Island. It was gazetted as a wildlife sanctuary in 1985 but later incorporated into the Talang-Satang National Park when this was created in 1999. 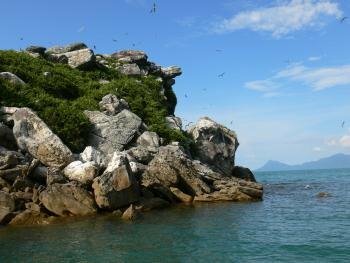 The reason why the rock is protected is because it is inhabited by a breeding colony of Bridled Terns & Black Naped Terns. A group of us went out there last week. I occasionally head out to the waters around Satang to see if there are any Bottlenose dolphins around. I haven’t been to Tukong Ara for a few years so was keen to have another look. Whilst the terns were interesting, I was fascinated by the Pacific Reef Egrets that also make the rock their home. It is common to see various species of white coloured egrets all around the Kuching area. For a non-birder like me egrets are white. So when I first caught sight of two beautiful birds perched on Tukong Ara that looked like egrets but had a grey plumage I was a tad confused. Thankfully, a keen birder was part of our group and explained that it was a Pacific Reef Egret. Birding in Malaysia is great resource on Sarawak's birdlife. And for some good shots of the Pacific Reef Egret check out Oriental Bird Images. I've been fascinated with Irrawaddy dolphins every since I first spotted a group of dolphins in a river estuary near Kuching. Since then I've developed a bit of an addiction to dolphin watching. I am not a marine mammal expert so don't expect too much 'science'. I just want to spread the word about Sarawak's Irrawaddy dolphins and what a unique natural resource they are for the State.